Yoga mats are ideal breeding ground for bacterial and fungal growth. Considering how many bodily fluids (like sweat and saliva) come into contact with the surface of yoga mat after your exercise session, it is not surprising to learn that yoga mats can transfer diseases. Even washed, some poor quality yoga mats may still retain the unpleasant smell. Blank yoga mat is the world’s first yoga mat to try to address this problem. 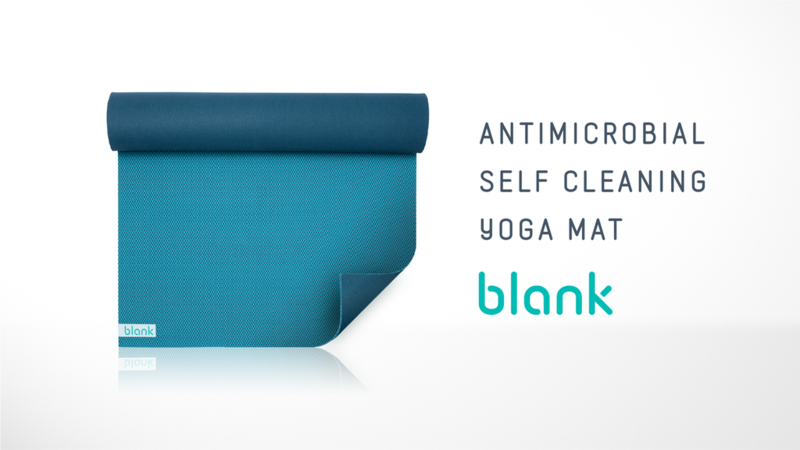 Using technology featured in sports clothing lines such as Converse and Adidas, Blank yoga does not only eliminates germs and pathogens on the surface of the yoga mat but it also gets rid of any foul odors. Blank yoga mats remain pleasant-smelling and germ-free no matter how intense your workout is. Blank Yoga mats are made using natural rubber that has been infused with polyester threads. Although natural rubber provides the yoga mats some extra flexibility, it does not support silky-smooth transitions between poses. It is for that reason that the polyester thread has been included in the design of the Blank yoga mat. The standard size of Blank yoga mats is 68″ long, 24″ wide, and 3mm thick. For those in need of more workout space, the 71-inch long by 26-inch wide XL yoga mats should provide enough space for all kinds of yoga poses. Remarkably, XL yoga mats are also 2mm thicker than the standard size mats, which is perfect for individuals who prefer a bit more cushioning. Blank yoga mats are excellently designed to accommodate all types of yoga poses. Meanwhile, smaller rubber knobs have been added to provide all the fiction needed for stability even when your mat is full with sweat. On the other hand, the polyester thread embedded in the rubber helps to switch from one pose to another easily and more gracefully. The underside of Blank yoga mat is seamlessly lined with smooth, natural rubber that firmly grips the floor, ensuring you don’t have to readjust your yoga mat during a workout again. To make sure you have clean and odor-free workouts, Blank Yoga mats have been infused with naturally sourced silver salts which resist odors and kill the microbes that may come into contact with the mat. This is the same technology used by sports clothing brands to keep the fabric odor free and also keep microbes at bay. Other than the occasional cleaning with a damp cloth or wash away dirt, grit, and other visible stains, Blank yoga mats do not require much maintenance. Blank yoga mats are currently only available in turquoise, purple, and gray. On the few occasions that the Blank yoga mat will need to be cleaned, all you will need is a damp cloth to remove dirt or any visible stains. The silver salts are enough to maintain the mat’s hygienic properties for more than 1,000 workout hours. Silver salt technology ensures that the yoga mat never retains any bad odors no matter how much you use it. The rubbery underside delivers maximum grip on most surfaces, saving you from the hassle of having to keep readjusting your mat mid-workout. Both the standard size and the XL yoga mats are thick enough to provide sufficient comfort for various yoga poses. They are also comfortable and provides adequate space for all your poses. Blank yoga mats are not exclusively for practicing yoga. They can also be used for pilates, and fitness training. Blank yoga mats are made from 100% natural rubber that has been sourced from non-Amazonas trees. The manufacturing process emits zero pollutants and does not result in harmful waste. Also, no chemicals are used throughout the manufacturing process. Currently, Blank yoga mats are only available in three colors. Hopefully, the manufacturer will consider expanding the color options once the mats go into full production. There are already lots of competitors who create very similar yoga mat in the market. A standard size self-cleaning, antimicrobial Blank yoga mat will retail at $75 upon the official launch while the XL version will go for $90. The eco-friendly yoga mats are slated to launch as early as November this year and will ship globally. You can get one now at a special price for only $59, the quantity is limited, check the link below for availability and latest pricing.